CHRISTY NIELSEN WENT TO AFRICA AND SAW A BIRD THAT CHANGED HER LIFE. Christy Nielsen went to Namibia Africa, not to photograph birds, but to look at rocks and the dramatic landscapes in the African nation. “I drove myself around the northern part of the country,” said Christy. Since that first sighting of Africa’s beautiful Lilac Breasted Roller, Christy’s treasure hunt has never stopped. Those brown silhouettes that flit and fly through our lives are way more than just birds. “Birds are the most common things in nature,” she said. they look like and appreciate the details.” Of course, you have to take the time to stop and look. For Christy, stopping and looking has become an obsession that has paid dividends … dividends she is sharing with Facebook friends, Flickr and on Instagram. The planet where we live is it is not just about us, according to Christy. It’s about how it all fits together. Her bird and occasional animal photographs bring the balance of nature and the fragile environment to us. They make us wonder and think about the life that surrounds us … the life we rarely take the time to see or even think about. “It makes you see all the pieces. It is all a part of the system,” says Christy. 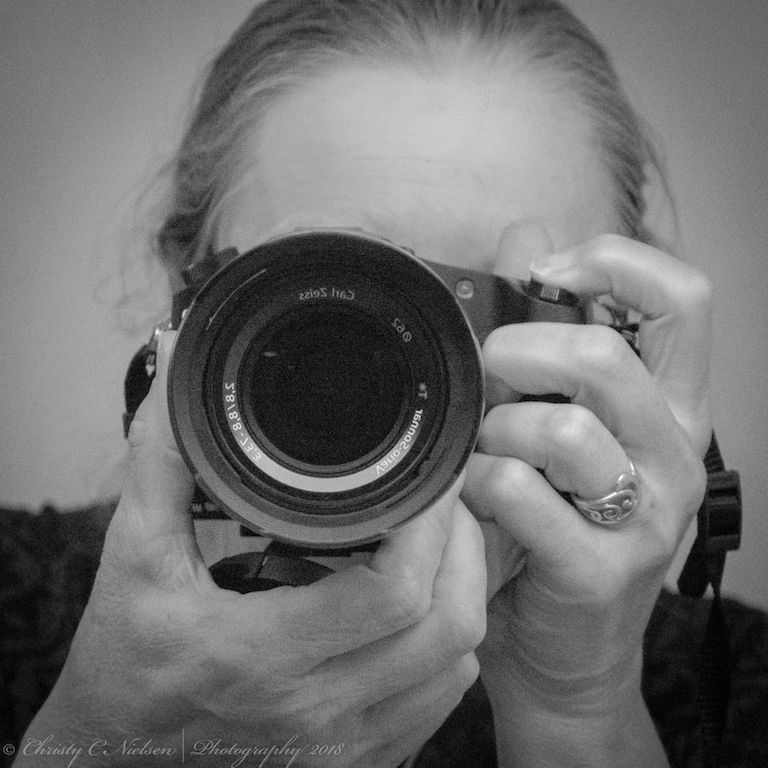 Over the past several years, Christy has taken photography courses and photography trips to hone her skill set. To bring her images to us, Christy has continued to purchase lenses and bodies that are capable of the highest resolution possible. Currently, her primary camera system is Canon and the 1DXMkII, 5DMkIV, and 7DMkII are her favorite bodies. The 7DMkII with its 1.6 crop factor allows her Canon 100~400 F4 L lens to become a 160~640 zoom, getting her closer to her skittish subjects. She also has a Sigma 150 ~600 mm zoom. Any wildlife photography requires patience … lots of patience. 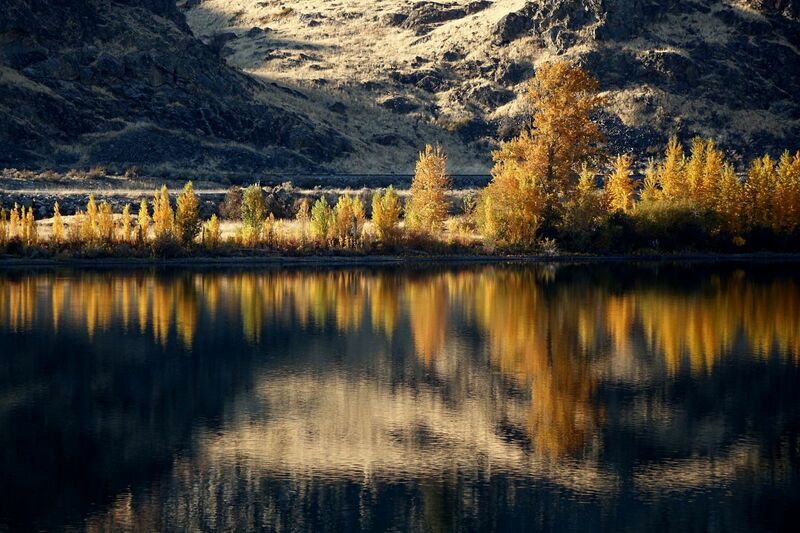 Christy has several favorite shooting grounds; the Waterville and Okanogan Plateaus. “I have certain roads I drive on,” she said. One primitive road leads to a little lake on the Waterville Plateau that she has gained permission to be on. “I shoot from my car a lot,” she says. It becomes a bird blind of sorts. Many of her subjects would fly off if she emerged from the car. She also has a popup bird/animal blind that she uses to photograph Sandhill Cranes. Christy has become somewhat of an expert at identifying birds but says she uses Google a lot for identification and also relies on birders like Virginia Palumbo and the NW Audubon Society for more difficult identifications. One of Christy’s most engaging and exciting encounters this past winter was with several Snowy Owls up on the Waterville Plateau. “It was an interesting experience,” says Christy. Snowy Owls migrate south from the Arctic in the winter, and if we are lucky, some years “incursions” occur bringing them as far south as locations in Washington State. One of Christy’s most engaging and exciting encounters this past winter was with several Snowy Owls up on the Waterville Plateau. “It was an interesting experience,” says Christy. Snowy Owls migrate south from the Arctic in the winter, and if we are lucky, some years “incursions” occur bringing them as far south as locations in Washington State. I drove up every night after work,” said Christy. This determination paid off with some incredible images of the Snowy Owls, even though dusk was falling and the light was low. 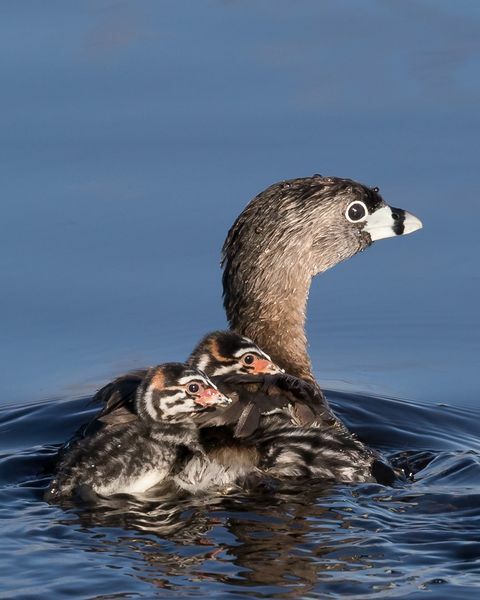 From the far reaches of Africa to locations in eastern Washington and Oregon, Christy has put together an incredible library of bird photos including one alarming event. She drove up to Cassimir Bar, near Brewster, to see if she could capture a photograph of a rare Northern Hawk Owl that had migrated south. 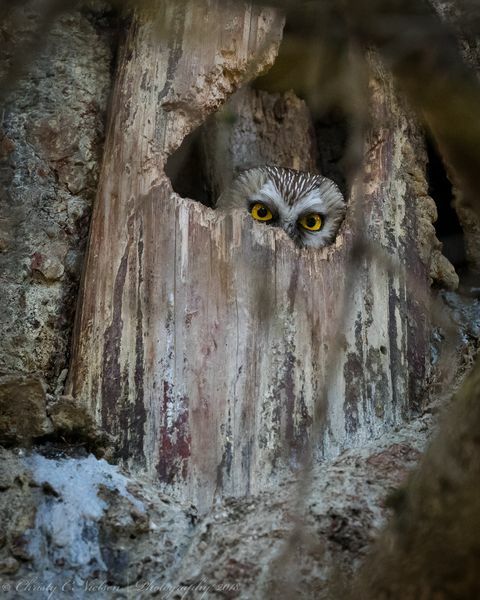 What she found was the owl dead in the tree where it was roosting. The landowner was angry with birders driving long distances to view this bird and ended up shooting it. Of course, he was heavily fined, and Christy’s photo of the owl was used on King Television and in the Audubon magazine. “Here is something rare, killed by a landowner because he was angry with birders driving long distances to view this rare bird,” said Christy. “That had a profound impact on me.” The incident raised some critical questions about birding and its ethics. According to Christy, birders need to respect private property and also to get permission before entering private property. 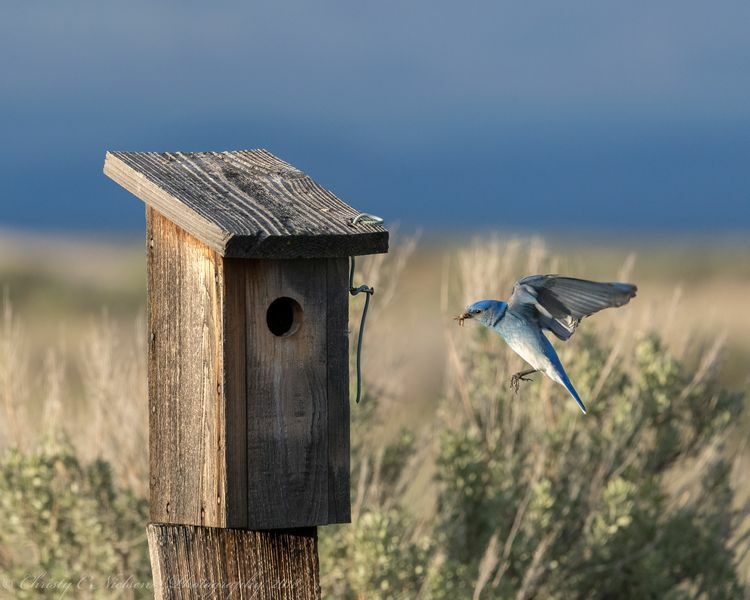 She has been able to digitally capture the entire range of birds in the wild from a whole meadow full of hummingbirds out by 25 Mile Creek State Park to bluebirds on Chelan Butte. Christy's travels around North Central Washington have allowed her to photograph a variety of hawks, owls, ducks, sparrows, eagles, and even the occasional wild animal. One day she decided to visit a pond in the Methow she had good luck with and instead of birds, she found three Moose. Christy was on the forefront of the incident at the Malhur National Wildlife Refuge that was taken over by ranchers. Christy was engaged in the battle to return the Wildlife Refuge to its owners, the public. “It is an incredible place to visit,” said Christy. Her latest travels have taken her up to the Northeastern part of Washington to photograph migrating birds and hummingbirds. Wild Birds Unlimited offers the best seed blend chosen by your local expert. They are fresh and formulated to care for your birds. Wild Birds Unlimited is a nature shop for birders. If you are interested in birding or photographing birds, Christy suggests you visit Beebe Springs Park just north of the Beebe Bridge. 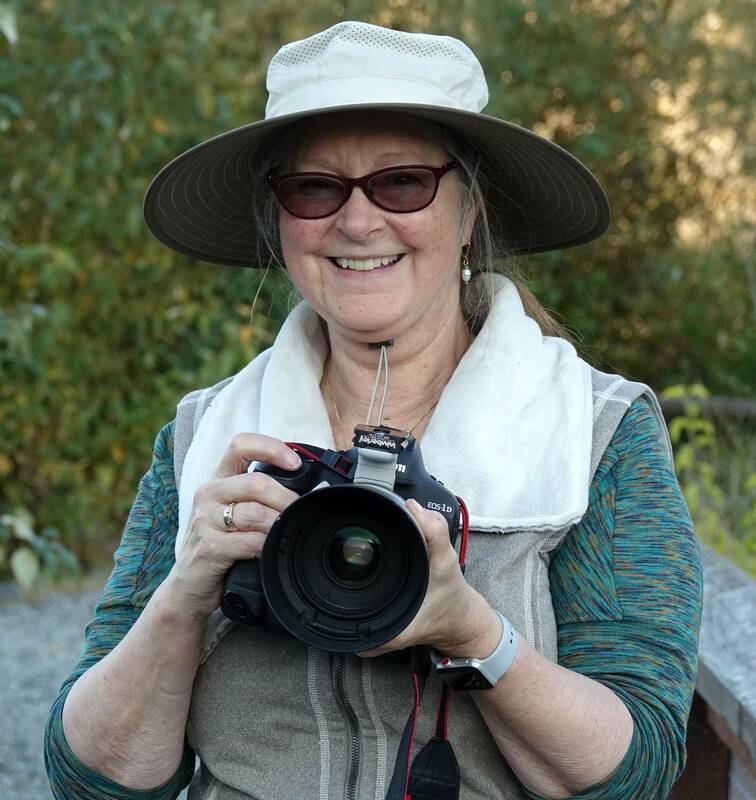 “I have seen and photographed wax wings, kingfishers, sparrows, herons, a muskrat,” she said. Patience is most often the key to watching birds in their natural habitat. Beebe Springs has several benches to sit and enjoy the scenery and river along with several bird blinds to hide behind.